I took these at the Pantà de Vallvidrera (see below) in Collserola, the huge urban forest park which encases the stone and concrete slab of Barcelona to the north-west. The Iberian green frog (or Iberian marsh frog Rana perezi), as its Spanish name (rana común) implies, is the commonest frog in Spain . It is present throughout the Iberian Peninsula , the Balearics and Southern France, and has been introduced into the Canaries, and is found as high as 2380m in the Sierra Nevada . They are the only (?) 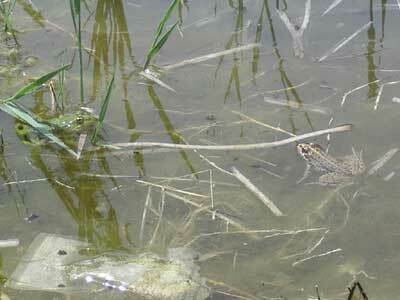 Spanish frog to be fully active during the day and hence are the easiest species to see. So no prizes for the photos. They are always found in association with permanent bodies of water, but without a preference for natural over artificial waters, and they support pollution and salinisation rather well. Iberian marsh frogs come in a range of colours, as can be seen in the photos: from an intense, dare I say beautiful green, to a dull brown, or even grey. 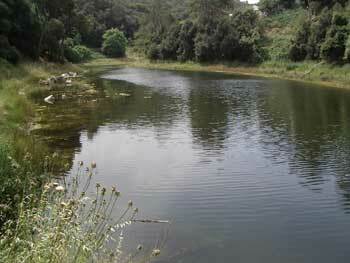 The small reservoir was a veritable cacophony of croaks mingled with the cries of children. Sunday is not the best day to visit. 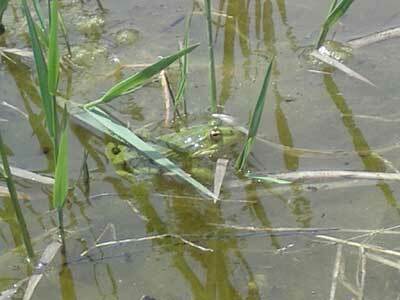 Despite this, the waters were a riot of young marsh frogs. There were also a couple of common tree frogs ( ranita de San Antonio ) and a tantalising glimpse of a newt, probably marbled. Dragonflies were out in number. The Pantà de Vallvidrera is a small reservoir with an architecturally unusual dam built from bricks in a modernist style, almost unique in Spain , or as my politically correct Catalan Collserola Guide says, in the Iberian Peninsula . It was built in 1864 as a reservoir for agriculture, but was soon taken advantage of for drinking water. It fell into disuse and degradation in the 1960's and was finally restored in 2003. In addition to the above mentioned amphibians, fire salamanders ( Salamandra común in Spanish Salamandra salamandra in Latin ) are also present, though I've only ever seen them squashed dead in the park. Take the Ferrocarrils de la Generalitat from, for example, Plaza Catalunya (note holm oaks). Normal metro ticket.. 15 minutes or so later get off at Baixador de Vallvidrera, which is in the heart of the park and follow signs to the Pantà. Alternatively don't bother and explore the forest instead.